Prized for their strength, stability, and perfect smoothness, hardwood panels have been a popular painting support since the 14th century. 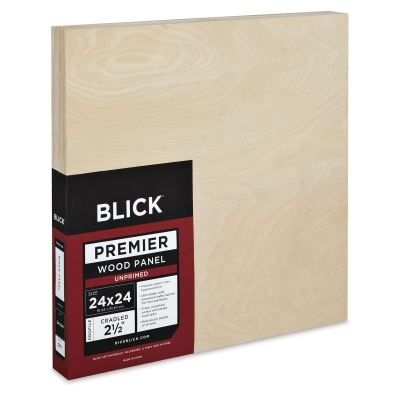 For today's artist, Blick is pleased to offer our Premier Wood Panels — among the best quality you can find on the market and, like all Blick products, a terrific value. 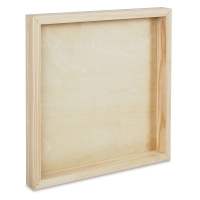 They feature a premium select 4 mm solid basswood surface braced by a solid basswood cradle. We've chosen basswood (also known as linden) for its fine, uniform characteristics, limited wood grain, and proven stability over time. Each panel is precision-crafted, meticulously sanded on all sides, and ready to prime with the ground of your choice. Because of their rigidity and resistance to bowing, Blick Premier Wood Panels are a popular support for heavy paint applications and encaustics. They are also great for mounting photos, paper, prints, fabric and more. They are backed by our 100% satisfaction guarantee. Note— Unfinished solid wood may expand and contract with changes in humidity and temperature. Conservators highly recommend that wood panels be fully primed on both front and back to ensure the long-term stability of your artwork. Order Fulfillment Note— As we complete a transition in stock, your order may be fulfilled with either Blick Premier Wood Panels or Utrecht Artists' Wood Panels. Rest assured, the fabrication details and workmanship of both brands are identical.